In August, 1878, Yellow Fever invaded the city of Memphis for the third time in ten years. By the month’s end the disease had become epidemic and a quarantine was ordered. While 30,000 citizens had fled in terror, 20,000 more remained to face the pestilence. As cases multiplied, death tolls averaged 200 daily. When the worst was over ninety percent of the population had contracted the Fever; more than 5,000 people had died. In that time of panic and flight, many brave men and women, both lay and cleric, remained at their posts of duty or came as volunteers to assist despite the terrible risk. 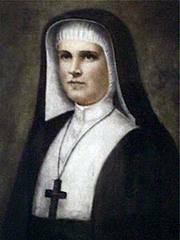 Notable among these heros were Constance, Superior of the work of the Sisters of St. Mary in Memphis, and her Companions. The Sisters had come to Memphis in 1873, at Bishop Quintard’s request, to found a Girls School adjacent to St. Mary’s Cathedral. When the 1878 epidemic began, George C. Harris, the Cathedral Dean, and Sister Constance immediately organized relief work among the stricken. Helping were six of Constance’s fellow Sisters of St. Mary; Sister Clare from St. Margaret’s House, Boston; the Reverend Charles C. Parsons, Rector of Grace and St. Lazarus Church, Memphis; and the Reverend Louis S. Schuyler, assistant at Holy Innocents, Hoboken. The Cathedral group also included three physicians, two of whom were ordained Episcopal priests, the Sisters’ two matrons, and several volunteer nurses from New York. They have ever since been known as “The Martyrs of Memphis,” as have those of other Communions who ministered in Christ’s name during this time of desolation. The Cathedral buildings were located in the most infected region of Memphis. Here, amid sweltering heat and scenes of indescribable horror, these men and women of God gave relief to the sick, comfort to the dying, and homes to the many orphaned children. Only two of the workers escaped the Fever. Among those who died were Constance, Thecla, Ruth and Frances, the Reverend Charles Parsons and the Reverend Louis Schuyler. The six martyred Sisters and priests are buried at Elmwood Cemetery. The monument marking the joint grave of Fathers Parsons and Schuyler bears the inscription: “Greater Love Hath No Man.” The beautiful High Altar in St. Mary’s Cathedral, Memphis, is a memorial to the four Sisters. We give thee thanks and praise, O God of compassion, for the heroic witness of Constance and her companions, who, in a time of plague and pestilence, were steadfast in their care for the sick and dying, and loved not their own lives, even unto death: Inspire in us a like love and commitment to those in need, following the example of our Savior Jesus Christ; who with thee and the Holy Spirit liveth and reigneth, one God, now and forever. Amen. We give you thanks and praise, O God of compassion, for the heroic witness of Constance and her companions, who, in a time of plague and pestilence, were steadfast in their care for the sick and dying, and loved not their own lives, even unto death: Inspire in us a like love and commitment to those in need, following the example of our Savior Jesus Christ; who with you and the Holy Spirit lives and reigns, one God, now and forever. Amen. Title. Why is it “Constance, Nun, and Her Companions”and not “Constance and Her Companions” (as in “Blandina and Her Companions, the Martyrs of Lyons” [June 2]}? The way it is now it suggests that the name of one of Constance’s companions was Nun. And the subtitle: “Commonly called “The Martyrs of Memphis” – this is leftover from a previous edition of LFF before General Convention changed the title of the commemoration. This information either belongs in the bio, conformed to the usage noted for Bladina (ex: “Constance and Her Companions, the Martyrs of Memphis”), or just list them as “Martyrs.” I favor just listing them as martyrs and would change Blandina’s title, too. The Martyrs of Memphis are a classic example of the kind of modern saints we shhould commemorat e. The “cultus” of the sisters is grounded in Memphis. The propers and biograohy remain unchainged from LFF, except for the addition of te OT passage from Job. It is probably appropriate, but I would look for a better one. I find the “,Nun,” irregular. 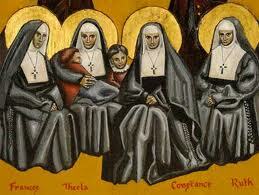 “Constance & Her Companions” looks better: anyone who doesn’t know she was a nun would soon know if they read the bio. The pattern is to show the office (“Bishop”, “Deacon”, etc.) under the title. I don’t think it’s necessary to write anything more than the present wording in this instance, however. In line 6 of the first paragraph, use a lower case “f” in “fever”. In line 2 of the second paragraph, I suggest we substitute “ordained” for “cleric”. The latter word nowadays is used to describe a single ordained person, not a number of clergy. “clerics” would also be acceptable, but I believe “ordained” is better here. In line 4 of the second paragraph, correct the spelling to read “heroes”. Also in line 4, delete “of the work”. A Superior is a leader of a religious community, not of that community’s work. Lines 6 & 7 of the second paragraph: use lower case and an apostrophe for “girls’ school”. Line 5 of the third paragraph: use a lower case “f” in “fever”. Add “Sisters” before “Constance” in line 6 of the third paragraph, and add a semicolon after “Frances” (the last of the list of Sisters who perished). “Yellow Fever” is usually not capitalized in medical literature. I would hope people would focus more on the sacrifice these workers of God tried to impress.I honestly think God wasn’t trying to impress grammatical or geographical flaws.I think the point is caring for mankind as God would. History buffs should really like this documentary. Dee, thanks for your comment. Next time, please include your first and last name. — Ed. I was reminded of how these brave souls cared for those in one of the dark hours of Memphis, TN history. Thank you for sharing a story many Memphians know well. I pray all would see the sacrifice and some how apply this to their every day life. In those days, messages from the pulpit were clear and unambiguous. James 1:27, look after orphans and widows and keep without spot from the world. … There was no cellphones, teevee, video games, and the violence people experienced was strictly >real< as in lynchings, overt racism, "Indian" eviction and degradation. The poor had the land, and the land had the poor. It was a different world. Today we live in divisions, confusion and propaganda; and it is less simple, less easy to get a clear mandate, what to do. I submit: Let's remove every mental distraction dragging us down and submit to the Holy Spirit in Truth, that in the Unity of the Savior we can find comfort, even if not in our assigned denominations. I'm an Anglican in with 7th Day Adventists, and we share the love of Christ and care for each other, anyway.